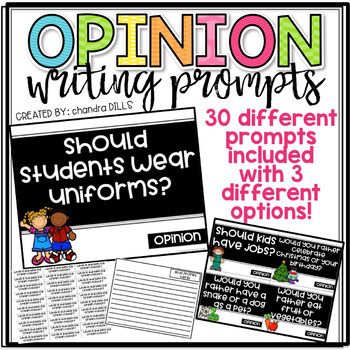 These are 30 different Opinion Writing Prompts to use in your classroom in different ways! What is the best sport to play? 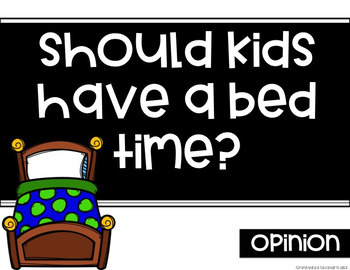 Should students have recess everyday? Would you rather eat sweet candy or sour candy? Would you rather watch tv or play video games? Would you rather build a snowman or a sandcastle? Each prompt is on a FULL page slide to project on your board. There are also smaller versions that have 4 prompts to a page to print, laminate, and clip together! These would be great in a center! There are also prompts with 30 (of the same prompt) per page that students can glue on writing paper OR in notebooks! So many different options for your classroom! 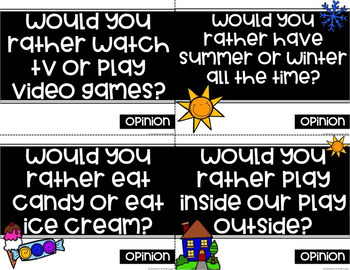 There is also 2 different versions of opinion writing graphic organizers and writing paper included!